WATCH: How long does it take you to fall asleep? There's a simple way to measure how long it takes you to fall asleep - \all you need is a bed, a baking tray, a teaspoon and a stop watch. Sleep latency is the length of time that it takes to accomplish the transition from wakefullness to sleep. And there's a simple way to measure it. All you need is a bed, a baking tray, a tea spoon and a stop watch. A new study has revealed that teenagers with ADHD need a good night's sleep – subjects showed significant declines in working memory, planning and organisation, emotional control, initiation and inhibition when they slept for only 6.5 hours a night. Tossing and turning, feeling congested, and waking up feeling the worse for wear? Allergies can wreak havoc on quality sleep. Here's why, and what you can do about it. He sleeps on average 20 minutes a night and frequently goes without sleep for up to two days at a time. Dr Alison Bentley is a general practitioner who has consulted in sleep medicine and sleep disorders, in both adults and children of all ages, for almost 30 years. She also researches and publishes on a number of sleep-related topics both in formal research journals and lay publications including as editor of Sleep Matters, an educational newsletter on sleep disorders for doctors. Q: Can Trazodone be used to help with sleeping problems? An error has occured. Please try again later. 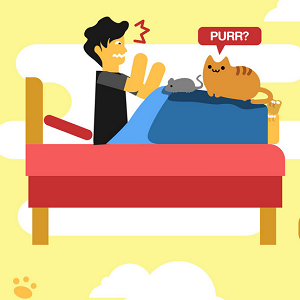 Is your cat affecting your sleep?